A big congratulation to our CBC ladies for winning the 2019 GTTBA Women's Annual Championship Tournament!! From my information, this is the first time that a bowling club took all top 3 spots in the annual team championship. Excellent performance ladies!! Congratulations!!! Due to the worsening weather condition (snow / ice pellets/ freezing rain), Tuesday League tonight (Feb 12, 2019) will be cancelled. · All current Chinese Bowling Congress leagues bowlers as of Jan 2, 2019. · Highest average (minimum 21 games) of 2016–2017 winter, 2017 –2018 winter from year book. Current 2018–2019 winter will be used as of before Jan 2, 2019 (minimum 21 games) if no previous year book's average. With no valid average, a bowler shall use 230 as average, or CBC will assign an average based on bowler’s previous record. · A bowler has the responsibility to report a current average which is 10 pins higher than the previous 2 year’s average, failing to do this will lead to disqualification, forfeiture of games, prizes and standings aside from any other penalties that may be imposed. • $10 per one qualify entry, unlimited entries. · All 40 bowlers will bowl 6 games. · 4th to 5th positions will bowl 1 game, the highest score with handicap will advance & bowl against the 3rd seed . Winner will bowl against the 2nd seed. Winner will bowl against the top seed to determine the champion. 12. All paid entry participants will have a Chinese new year gift. · If both scores were on same date, high game scratch of the set will advance. · For Semi-final and final rounds – 2 frames roll-off, 9th and 10th frame with 1/5 of handicap rounded down added to the pinfalls. · One lane courtesy is observed. All powder is not allowed on shoe sole, bowler's area and approach. Non-bowler is not allowed in bowler's area. · No headgear or sleeveless shirt, no jeans with holes. For men, no shorts. · Ladies may wear skirts, shorts or slacks. · It is the bowler's responsibility to ensure that all bowling balls used during the tournament are verified legal under CTF/USBC Specifications. · Tournament committee reserve the right to examine the balls used by the participants. Use of an illegal ball will lead to disqualification and forfeiture of games, prizes and standings aside from any other penalties that may be imposed. · This is a non-sanctioned tournament. However, all tournament rules of CTF /USBC are applied. · CBC reserves the right to accept or refuse entry to this tournament. · An appeal must be submitted in writing to CBC within 7 days after the tournament for CBC's final decision. - Highest of CTF, USBC and other sanctioned average (minimum 21 games) of 2016-17 Winter league & 2017-18 Winter league, other sanctioned averages need approval/validation from their associations. - 2018 summer sanctioned league average will be used if it is 10 pins or higher and with minimum 21 games. *** It is the responsibility of bowler to verify and report their highest sanctioned regular and sport league averages with minimum 21 games. Fail to report the correct average will lead to disqualification and forfeiture of games, prizes and standings aside from any other penalties that may be imposed. - Bowlers without acceptable average, will bowl in Master Division. The standard averages for participants in both Open and Graded division will be converted to sport averages based on the USBC conversion chart, please see bowl.com. 185 standard average = 160 sport average. Reminder to all Sunday League Bowlers that registration starts at 9:15am tomorrow! Due to poor weather conditions, tomorrow's league (April 15)is cancelled. Please let all your teammates know. Tomorrow's scheduled matches will be played next Sunday. 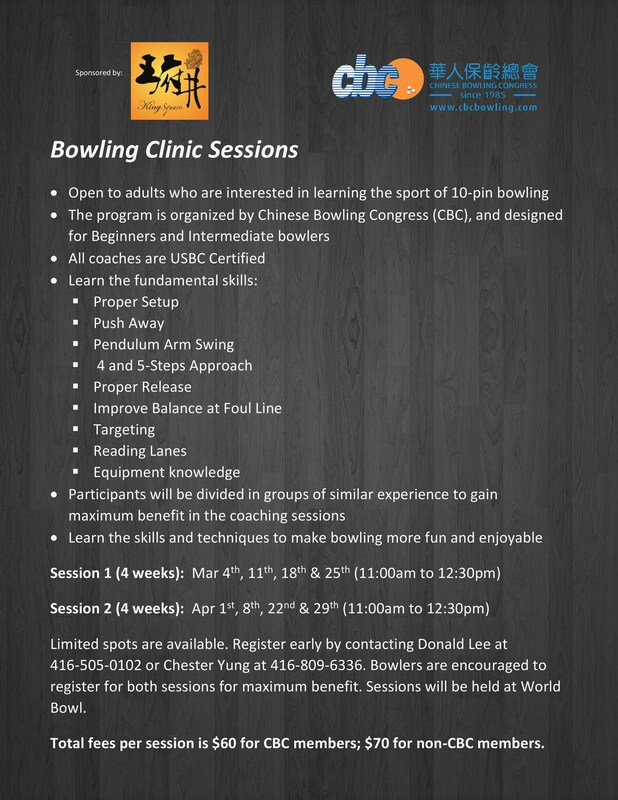 Open to all Chinese* Canadian bowlers from C.B.C. & C.C.B.A. of Toronto, O.C.B. from Ottawa, NACBT from Vancouver, C.C.B. from Calgary, M.C.B.A. from Montreal and USBC from U.S.
MASTER DIVISION – Scratch basis. Open to bowlers of all averages. Entry Fee $240. OPEN DIVISION – Scratch basis. Open to bowlers with an average of 205 and under. Entry Fee $220. GRADED DIVISION – Handicap basis. Open to bowlers with an average of 199 and under. Entry Fee $180. Note: All out-of-province bowlers who wish to participate in the tournament must pre-register and pay a deposit of $100 to their team delegates by October 2nd, 2017. Please contact Donald Lee or your league manager/secretary for registration. 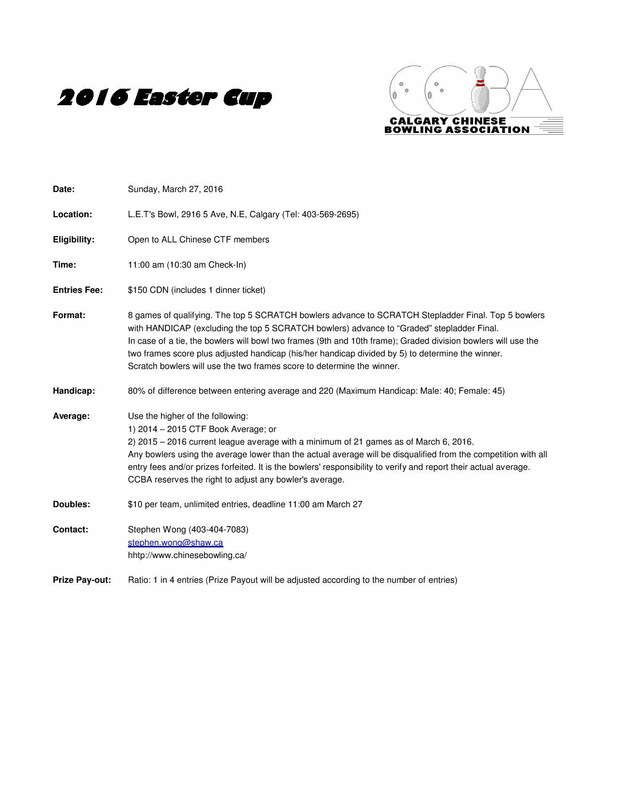 Open to all Chinese descent* current members of USBC/CTF or any affiliated associations of USBC/CTF/WTBA. *Chinese origin or first generation Chinese descent (at least one parent of Chinese origin). Tournament director will handle any questionable circumstances. It is with heavy hearts that CBC is extremely sadden to announce the untimely sudden passing of a dear friend Peter Tse. Visitation - 1 p.m. to 2 p.m.
Ceremony - 2 p.m. to 3 p.m.
Limited spots are available. Register early by contacting Donald Lee at 416-505-0102 or Chester Yung at 416-809-6336. Bowlers are encouraged to register for both sessions for maximum benefit. Sessions will be held at World Bowl. Total fees per session is $60 for CBC members; $70 for non-CBC members. Congratulations to all the winners and thank you for King Square 王府井's generous sponsorship! Handicap: Open Division - 60% of (205 minus average), max. – 20; Double - 75% of (230 minus average), men max. – 30, ladies max. – 40. MASTER DIVISION – Scratch basis. Open to bowlers of all averages. Entry Fee $230. OPEN DIVISION – Scratch basis. Open to bowlers with an average of 209 and under. Entry Fee $210. Lane Conditions: Day 1: 34” Stockholm - Short pattern; Day 2: 45” Rome - Medium pattern; Finals: Stockholm and Rome per pair of lanes (Stockholm on one, Rome on the other). Bowler with the higher seed picks which pattern to start with. Note: All out-of-province bowlers who wish to participate in the tournament must pre-register and pay a deposit of $100 to their team delegates by August 29th 2016. 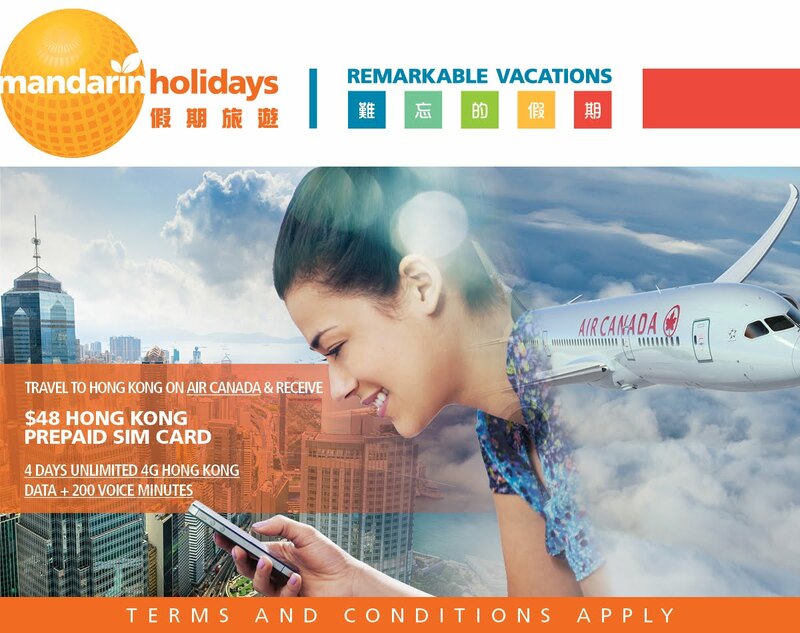 LIMITED SUPPLIES: Travel to Hong Kong on Air Canada and receive "$48 HONG KONG PREPAID SIM CARD - 4 days unlimited 4G Hong Kong data + 200 voice minutes". Book while supplies last! Contact us today for more details! 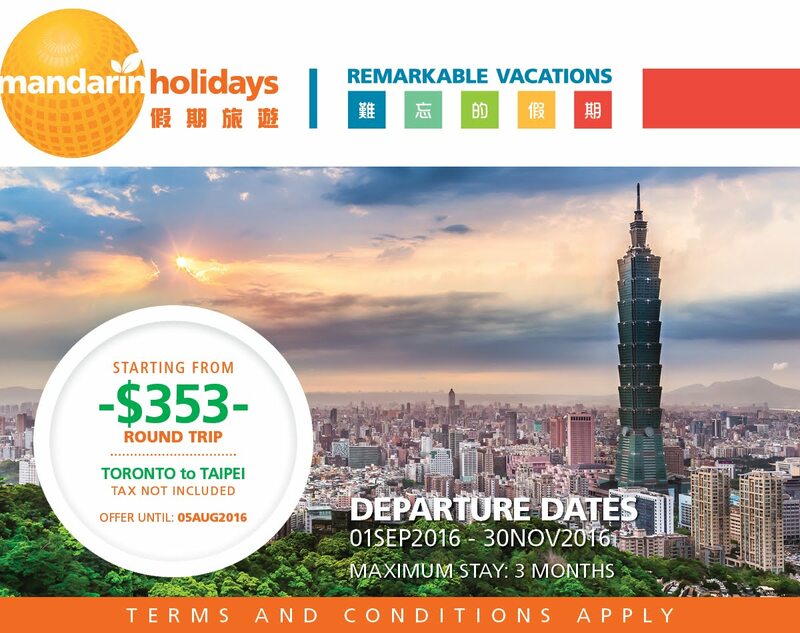 LIMITED TIME OFFER: Starting at $353 tax not included from Toronto to Taipei!! Departure September 1, 2016 to November 30, 2016. Tickets available NOW to purchase until August 5, 2016 with maximum stay of 3 months. Contact us today for more details! FLASH SALE: Starting from $288+tax from Toronto, Montreal, Ottawa to Beijing [ROUND TRIP]!! Offer until: July 22, 2016! Departure dates from "January 28, 2017 to February 15, 2017". Tickets available to purchase NOW! Terms and conditions apply. 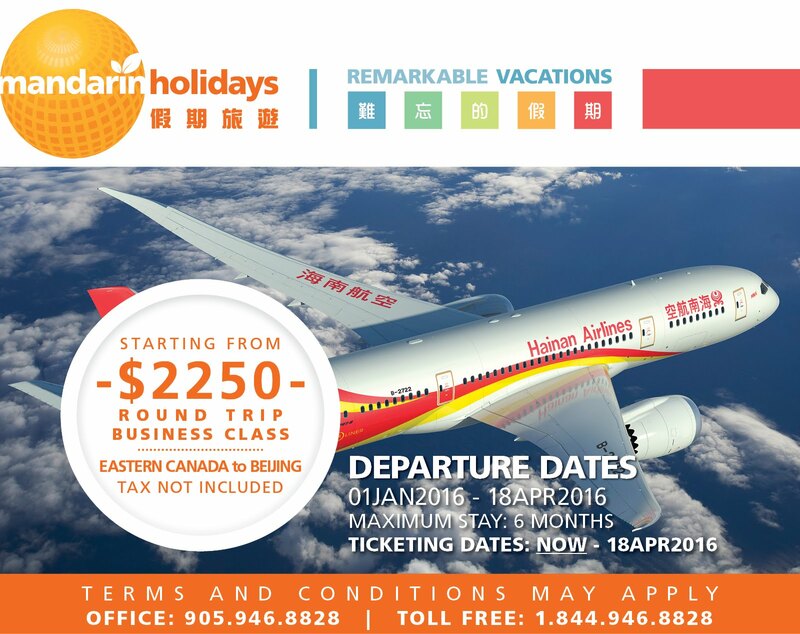 Contact Mandarin Holidays at 1.888.991.9906 or 1.855.752.3838 for more details. 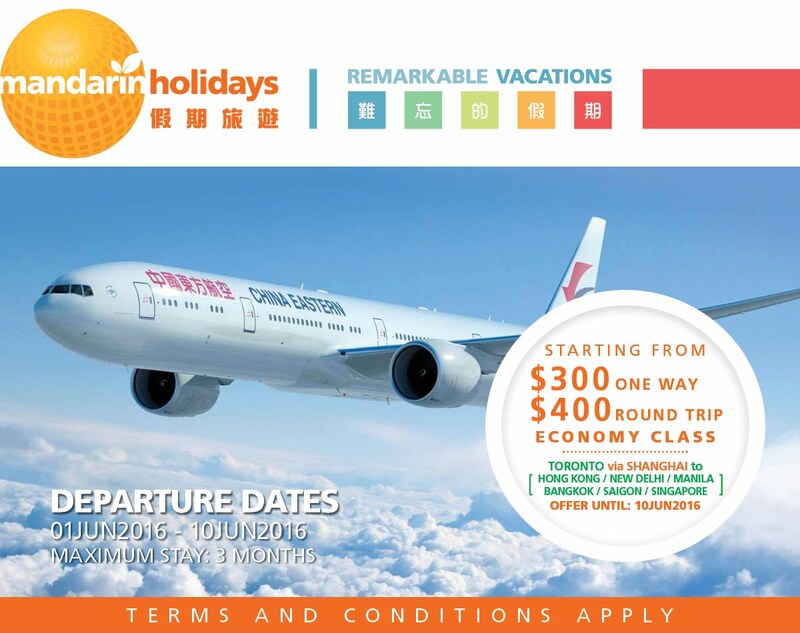 LIMITED TIME OFFER: Starting from $400 for Toronto to Beijing [ROUND TRIP]!! Offer from July 12, 2016 to September 4, 2016! Departure dates from "July 28, 2016 to September 4, 2016" and with maximum stay of 3 months. Tickets available to purchase NOW! Terms and conditions apply. Contact us for more details TODAY! Starting from $240 for Toronto to Shanghai with FREE transfer to China major cities!! Offer ends June 10, 2016! Departure dates from June 1, 2016 to June 10, 2016 with maximum stay of 3 months, tickets available to purchase NOW! Terms and conditions apply. Contact us for more details TODAY! Starting from $300 for Toronto to Hong Kong, New Delhi, Manila, Bangkok, Saigon and Singapore!! Offer ends June 10, 2016! Departure dates from June 1, 2016 to June 10, 2016 with maximum stay of 3 months, tickets available to purchase NOW! Terms and conditions apply. Contact us for more details TODAY! 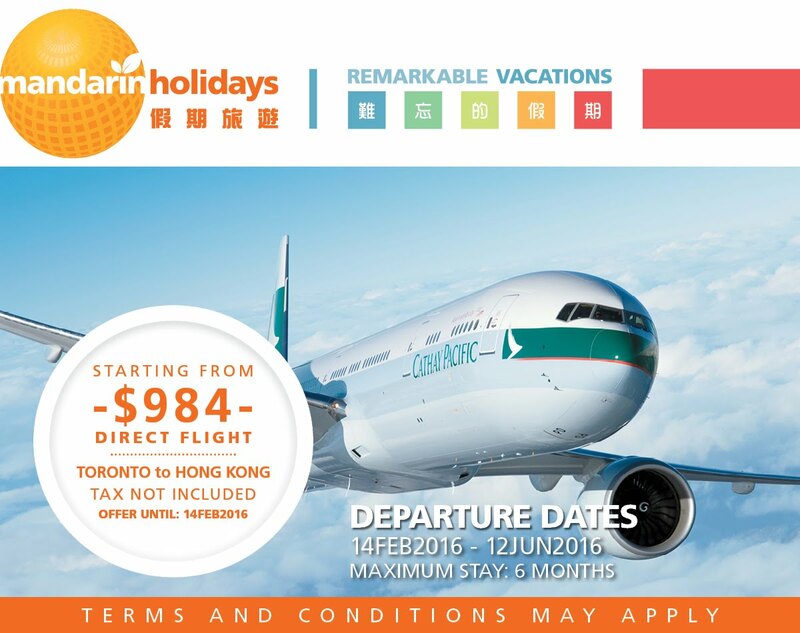 LIMITED TIME OFFER: Starting from $1190 for Toronto to Hong Kong!! Offer ends May 15, 2016! Departure dates from July 2, 2016 to August 30, 2016, tickets available to purchase NOW! Terms and conditions apply. Contact us for more details TODAY! Start Date of 2016 CBC Monday Summer League will be postponed to May 9 at Markham Bowl. Current league registration has reached capacity. However, if interested to join, please contact Raymond Leung for information. USBC revokes certification approval of two Motiv balls (Jackal and Jackal Carnage) on March 15th, 2016. According to CTF Playing Rule #1: Leagues and tournaments must be organized and bowled in accordance with the CTF Constitution, rules and regulations. These events must be scheduled on lanes that are currently CTF certified and only USBC approved equipment may be used. For this reason, Motiv Jackal and Jackal Carnage will not be allowed to use in any CBC leagues from now on. Bowlers who used the Jackal or Jackal Carnage in competition on or before March 15, 2016 with no prior knowledge of their ball being out of specification would not be subject to forfeiture under CTF/USBC rules. Since World Bowl is going to dress the lanes before league starts, practice start time will move back to 9:45pm. If you see this message, please let your teammates know! Chinese Bowling Congress wishes you and your family a joyful, bright, healthy, prosperous and happiest new year ahead! Happy Chinese New Year. Due to lane availability, the special squad starts at 1:00pm to 2:30pm on Feb 7th. More than $4000 total prize fund! Note! Reserve bowlers please come to standby on tournament day to replace any qualified bowler who does not show up. King Square 王府井 (www.kingsquare.ca) is a mixed-use commercial development located on Woodbine Avenue, north of 16th Avenue, in Markham. The project is being developed in three phases. The first phase consists of over 340,000 sq.ft. floor area in a 3-storey Asian themed commercial, retail, and convention center complex. This phase includes 1,500 underground parking spaces, and a landscaped roof garden on approximately four acres of land. When completed in 2016, it will be the largest Asian shopping mall in North America. LIMITED QUANTITY: Travel to Beijing from Toronto start at $708 with TAX INCLUDED!! Contact one of our store now for more details! Offer ends February 29, 2016. Right now, Cathay Pacific has a promotion right now that is Toronto to Hong Kong, round trip, direct flight, starting from $984. Offer ends on February 14, 2016. WeChat Lucky Draw: Mandarin Holidays is going to be giving away a pair of Raptors Tickets for the game on March 28 against the OKC Thunder. The winner will be announce on February 10, 2016. 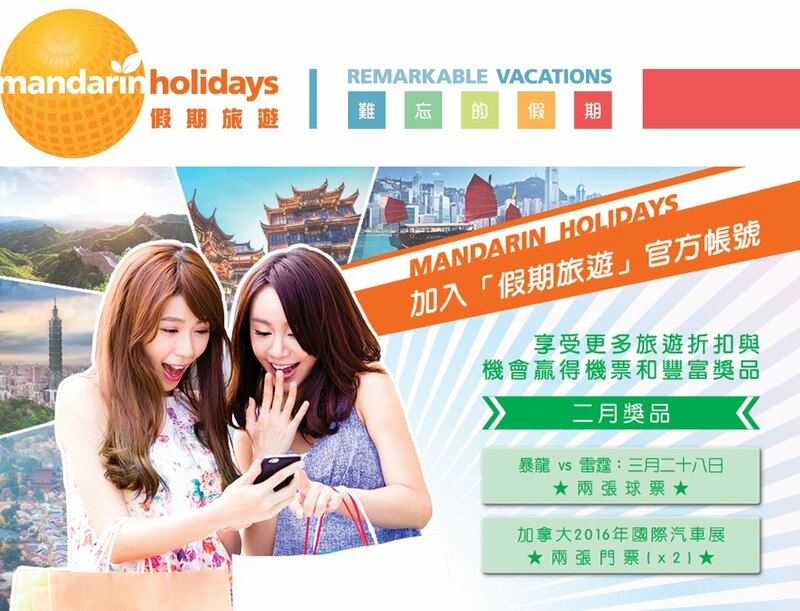 For people to join this draw is by subscribing to Mandarin Holidays' WeChat and that's all you got to do. The secondary prize is x2 pairs of tickets to this year's 2016 AutoShow (a total of 4 tickets). Terms and conditions may apply as well. Congratulations to Benny Sin for bowling a Perfect Game on Thursday January 21st at World Bowl (Thursday League)! 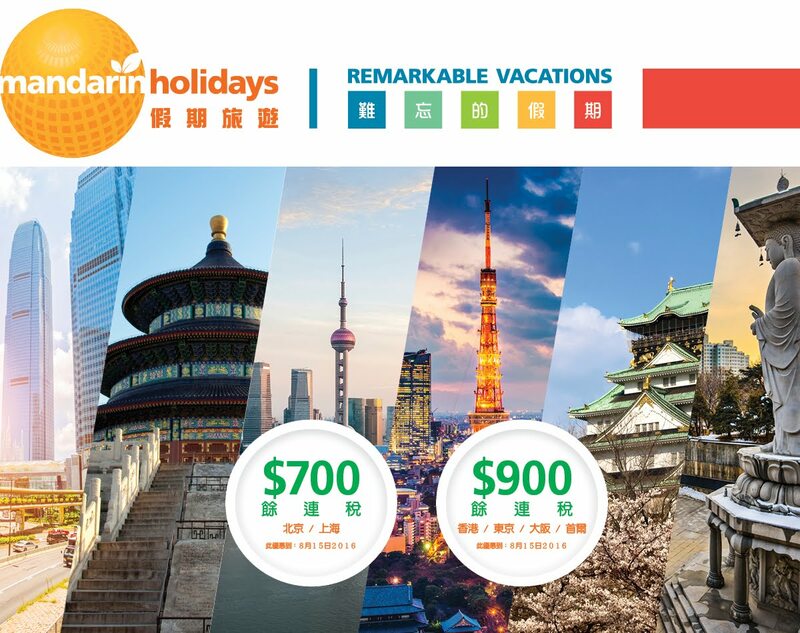 For the following deal only: Mandarin Holidays will like to extend an offer of additional $20 off to CBC Bowling Members to purchasing the airfare (Beijing/Shanghai and HK/Korea/Japan). And on top of that...if customers refer by CBC Bowling Members, the customers will receive the $20 off as well! Congratulations to Colin Tam for bowling a Perfect Game on Tuesday November 24th at World Bowl (Tuesday League)! Congratulations to Vincent Li for bowling a Perfect Game on Tuesday October 13th at World Bowl (Tuesday League)! Master - The top 4 bowlers with highest 12 games total pinfalls (Day 1 & 2) will advance to the stepladder final. Open Division - The top 3 of bowlers with the highest 11 games total pinfalls ( Day 1 and 2) in the scratch and handicap section will advance to stepladder final. Blind-Double - The top 3 total scores with handicap of all 7 games in Day 1 will cash. Prizes - cash ratio is 1 in 4, based on 26 Master, 21 Open entries. Registration: September 8th to October 4. Full entry fee must be paid to CBC by October 4. Registration: Bowlers must pre-register and pay a deposit of $100 to CBC league committee by August 29th 2015. Master Division - $230. Scratch basis. Open to bowlers of all averages. Open Division - $210. Scratch basis. Open to bowlers with an average of 209 and under. Graded Division - $180. Handicap basis. Open to bowlers with an average of 199 and under. 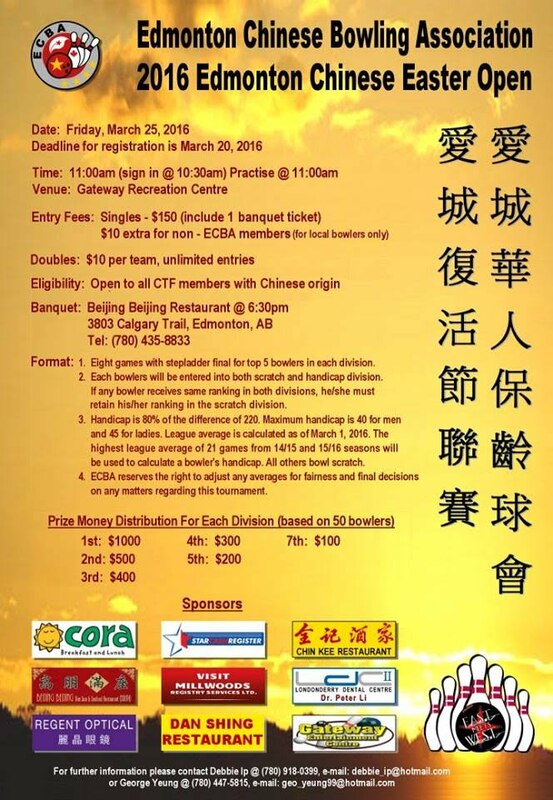 Eligibility: Open to all Chinese* Canadian bowlers from T.C.B.C. & C.C.B.A. of Toronto, O.C.B. from Ottawa, NACBT from Vancouver, C.C.B. from Calgary and M.C.B.A. from Montreal. *Chinese origin or of Chinese descent from parent that is of Chinese origin. Handicap (Graded Division Only): 80% of 200 minus average. Maximum per game – Men/20 pins, Ladies/30 pins. 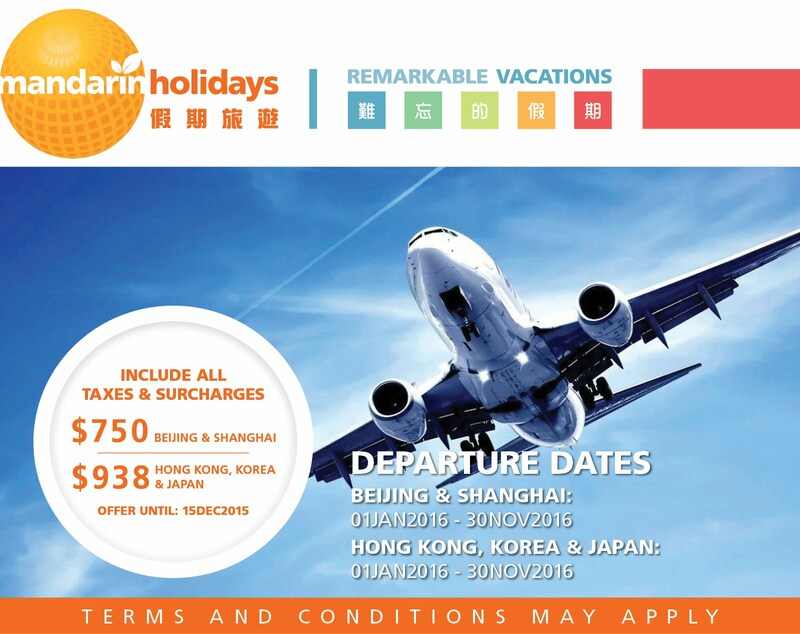 Mandarin Holidays offers you a direct flight (AC) to Beijing & Shanghai starting from $798! Hong Kong, Korea and Japan starting from $980! ALL TAXES & SURCHARGES ARE INCLUDED !! Flexible dates are available!!! Please contact ASAP! Departure dates between August 17, 2015 and June 10, 2016. Offer ends August 31, 2015. Congratulations to Siu Chuen Chan for bowling a Perfect Game on Monday August 10th at Club 300 Bowl (Monday League)! After 28 years of volunteering work with Chinese Bowling Congress, I would like to announce my retirement from the Committee Board of CBC when my current 2-years term of Presidency comes to the end by Aug 31/2015. I would like to thank everyone who helped me in the past 28 years during my period with CBC. Starting from Sep 1/2015, Donald Lee will be the new President of CBC. Under his leadership, I'm sure CBC will come to be the most successful Chinese Sports Community in North America! Note: Since 2014-15 Winter CTF Yearbook has not been released, bowlers are required to report to CBC if they have a higher 2014-15 Winter league averages (2014/2015) from other bowling league. Congratulations to Tommy Tam for bowling a Perfect Game on Monday July 13th at Club 300 Bowl (Monday League)! Time: Team squads are held at 5 p.m. and 8:30 p.m. (certain days), and doubles/singles squads will be at 9 a.m., 1 p.m. and certain days at 8:30 p.m. Entry fee: $55 per event, per bowler. All-events is optional and is $15. The total cost is $180 PER BOWLER, which allows them to compete in team, doubles, singles and all-events. July 4th 2016 - travel to Toronto. Sunday, Monday, and Thursday league format and prize distribution are updated. Congratulations to Frank Ng for bowling a Perfect Game on Sunday May 24th at World Bowl (Sunday League)! Congratulations to Darius Yeung for bowling a Perfect Game and 800 series (813) on May 22nd at World Bowl (Thursday League)! Congratulations to Daniel Chow's 300 game on March 5th, at Club 300 Bowl Thursday League! During the stage 2 of semi-final round, an inquiry has been made by a bowler regarding score discrepancy. An investigation by CBC committee has found that there was a distinct discrepancy between the written score and the automatic scorer printout which leaded to the disqualification of the involved bowler. It is the responsibility of all tournament participants to verify their scores. CBC committee has rectified the situation immediately and the cash prize standings was adjusted accordingly to ensure fairness to all parties involved. Sunday special squad for La Difference Cup on May 4th, but World bowl has a huge function on that day and 40 lanes will be occupied until 4pm. So in this case, Sunday special squad has to reschedule to the coming Sunday April 27th. Congratulations to all winners at the Ming Pao Fat Choi Cup! Wish you and your family a safe and happy Holiday Season. Due the weather severity, Sunday league is cancelled. December 22nd schedule will be made up on January 5th. To make it easier for bowlers, league rule is changed as following: absent bowler stays at the position of the regular line up. The bowlers (including absent bowler) must order themselves on the roster from low to high average. When bowling against an ABSENTEE: The player must beat the absentee score. In case of a tie, the points are split (divided equally). When ABSENTEE bowls against ABSENTEE: Point is split equally. When ABSENTEE bowls against DUMMY: Receives 0 point. Note: League Rules and League Format will be available soon! Tuesday Winter Cash League at World Bowl will start as planned on September 10th. The league is still accepting team entries and/or individual spare bowlers. Please contact Donald Lee (donaldlee00@gmail.com) for details. Congratulates to Patrick Chan and Donald Lee, who have been named to be 2013-2015 CBC president and vice president, respectively. For other committee members, please go to Committee section for details. Awards Presentation pictures: Please go to Photos Section. No Bowling on September 2nd. Monday Winter League will begin on September 9th. CBCBowling.com is currently down. Please visit CBCBowling.org to check updated league standings temporary. Copyright © 2018 Chinese Bowling Congress. All rights reserved.